Singapore is the most competitive economy in the region, placing second overall in the World Economic Forum’s (WEF) Global Competitiveness Index behind the United States (US). Singapore is seen as an exemplary economy as the report showcased the importance of openness for competitiveness amid escalating tensions and backlash against globalisation. The report also hailed the island state as “the most future-ready” economy in the world. It highlighted that economies that exhibit a high degree of openness like low tariff and non-tariff barriers, ease of hiring foreign labour and collaboration in patent application among others, also tend to perform well in terms of innovation and market efficiency. This in turn would have a positive impact on global economic health as a whole. Nevertheless, it is critical to enact policies that improve conditions of stakeholders which have been adversely affected by globalisation within their respective countries. However, due to its nature as an export-oriented economy, Singapore is susceptible to the indirect negative impact of the US-China trade war. “Should trade tensions escalate and translate into further measures involving larger trade volumes and more geographies, then the global economy could be impacted negatively,” explained Thierry Geiger, Head of Research and Impact at the WEF in an email interview with The ASEAN Post. “Even if not directly targeted by any trade measures, an open economy like Singapore’s would most likely be affected indirectly. For instance, less trade going through the country and a slowing demand in partner countries,” he added. The index this year uses a brand-new methodology which maps the competitiveness landscape of 140 economies via 98 indicators which are organised into 12 pillars. Each indicator uses a scale from 0 to 100, indicating how close an economy is to the ideal state or “frontier” of competitiveness. This new methodology aims to fully capture the dynamics of the global economy in the Fourth Industrial Revolution. It takes into consideration factors like idea generation, entrepreneurial culture, openness and agility which are key drivers of competitiveness that have never been a focus of major policy decisions in the past. According to Klaus Schwab, Founder and Executive Chairman of the WEF, the Fourth Industrial Revolution has become a definitive character of global competitiveness. “I foresee a new global divide between countries who understand innovative transformations and those that don’t. Only those economies that recognise the importance of the Fourth Industrial Revolution will be able to expand opportunities for their people,” he said. Of the 12 pillars, Singapore featured in the top 10 of seven pillars and in the top 20 of a further four. It led the trade openness component, topping the Product Market pillar. The island republic also ranked the highest in the Infrastructure pillar with a near-perfect score of 95.7 thanks to its world-class transport infrastructure, services and connectivity. It also achieved a perfect mark in the Health pillar as it boasts a healthy life expectancy of 74 years – ahead of even Japan. Three other member states of the Association of Southeast Asian Nations (ASEAN) which managed to break into the top 50 ranking include Malaysia (25th), Thailand (38th) and Indonesia (45th). 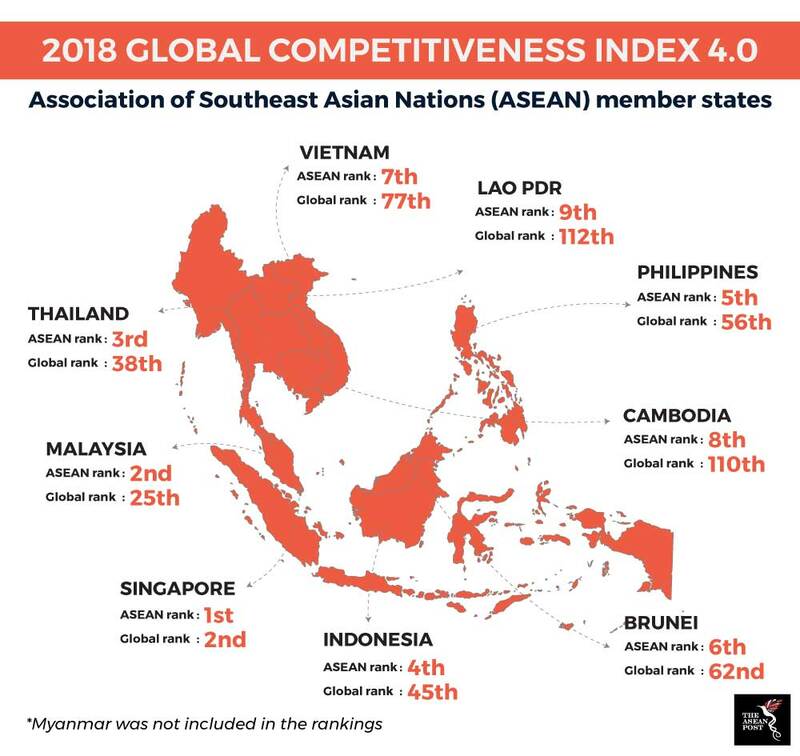 The remaining members except for Myanmar which wasn’t included in the index were placed outside of the top 50 with Vietnam (77th), Cambodia (110th) and Lao PDR (112th) ranked the least competitive within the ASEAN region. The report also praised Malaysia as being on par with many advanced economies and indicated that Indonesia, the Philippines, Vietnam, Thailand and Brunei are close behind. However, emerging markets like Cambodia and Lao PDR have much to improve and are vulnerable to a sudden shock, such as a faster-than-expected rise in interest rates in advanced economies and escalating trade tensions. 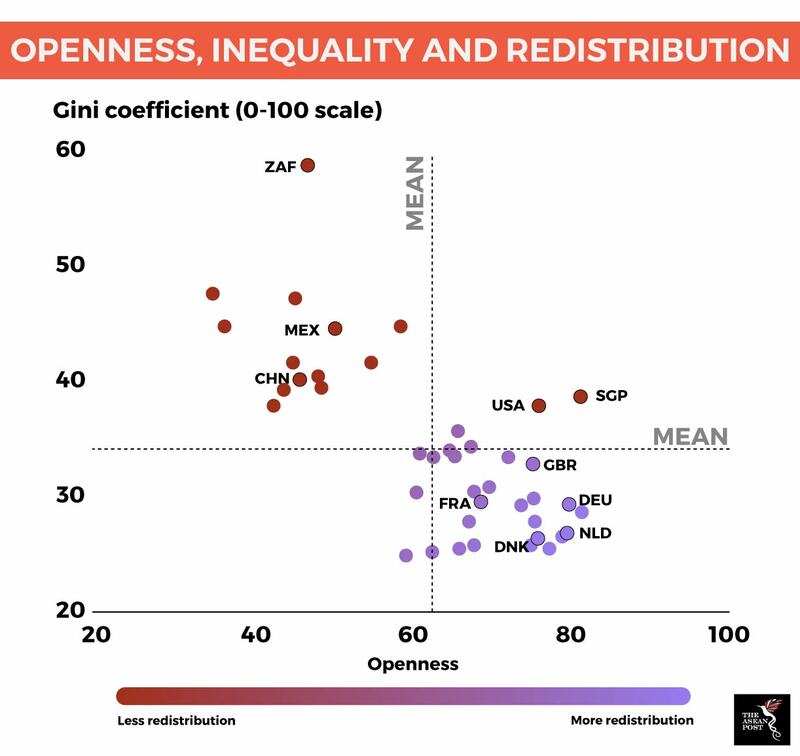 Inclusion is also a key factor and the report emphasised that there is no inherent trade-off between competitiveness and inclusion. Hence, it is possible to be pro-growth and inclusive at the same time. As such, the report encourages redistributive policies, safety nets, investments in human capital, as well as more progressive taxation aimed at addressing inequality. “Competitiveness is neither a competition nor a zero-sum game – all countries can become more prosperous,” said Saadia Zahidi, Member of the Managing Board and Head of the Centre for the New Economy and Society. She emphasised the need for a broad-based approach to raising competitiveness especially when it comes to innovation. “With opportunities for economic leapfrogging, diffusion of innovative ideas across borders and new forms of value creation, the Fourth Industrial Revolution can level the playing field for all economies,” she added. Governments must ensure that they pay adequate attention and focus on other accompanying development issues such as governance, infrastructure and skills-training. Economic competitiveness is fast changing as the world is increasingly transformed by digital technologies. This creates a new set of challenges. Governments and businesses must adapt to this shift or risk the long-term negative impact on future growth and productivity.